Auditions for the 2009-2010 WLA Traveling Choir will be held in the Choir Room from Monday, May 4 through Friday May 8, 2009. When you come to your audition, be prepared to sing the steps A-F below. You’ll also be asked to sight-sing two different exercises (step G), to test your level of musicianship. Please print out the Audition Information Form and bring it, along with a Letter of Recommendation from a WLA teacher or coach, to your scheduled audition time. You may sign up for an audition time on the Choir Room door. Sing the melody a song of your choosing, unaccompanied. Announce the title and composer of your song. Be prepared to sing the entire song, but you may be stopped during the song for the sake of time. Choose a song which highlights the vocal gifts God has given to you. Sing the first verse of America the Beautiful ("O beautiful for spacious skies for amber waves of grain, for purple mountain majesty above the fruited plain. etc.") in the key given for each voice type. Sing exercise #2 on "ah", beginning in the middle of your range. Repeat the exercise, each time a half step higher, until you have reached the upper limit of your useful range. Please announce at the beginning in what key you are starting. Sing exercise #3 on whatever vowel you wish, beginning in the middle of your range, at the same tempo as exercise #2. Repeat the exercise, each time a half step lower, until you have reached the lower limit of your useful range. Please announce at the beginning in what key you are starting. Sing your voice part on Since by Man Came Death, Chorus No. 46 from Handel’s Messiah. Use the recordings below to help you prepare for your audition. You will sing along with the "Accompaniment with voice played by piano" in your audition. If you cannot download the music, see Mr. Witte for a hard copy of the music and a CD of the recordings. At the audition you’ll be asked to sight-sing two different exercises to help determine your level of musicianship. Even though you won't see this music until you come to the audition, you should still come in with a plan. Read "Miss Lowell's Sight Reading Tips (for the non-reader)" to see one teacher's advice on how to prepare for a sight reading audition. Does anyone know who wrote the arrangement of the Star Spangled Banner which was sung at SuperBowl XXXIX? It was sung by the combined choirs of the US Naval Academy, US Air Force Academy, US Military Academy at West Point, US Coast Guard Academy, and was accompanied by the US Army Herald Trumpets. There is a moment in the final trumpet fanfares that sounds exactly like a John Williams quote from the end of his Olympic Fanfare and Theme from the 1984 Olympics, but I don't know if it is his or not. I'd like to use this arrangement at the beginning of the next school year to open a memorial run for a WLA graduate, Derek Dobogai, who died serving our country in Iraq. The National Association of Schools of Music (NASM) is an association of approximately 615 schools of music, primarily at the collegiate level, but also including postsecondary non-degree-granting schools of music. It is the national accrediting agency for music and music-related disciplines. The Association also provides information to the public. It produces statistical research, provides professional development for leaders of music schools, and engages in policy analysis. They also maintain a directory of accredited schools of music. This list can be used to find accredited schools of music across the United States or just in a particular state, like Wisconsin. The final church performance of the WLA Traveling Choir at Emmanuel, Hartford and Zion, Theresa has been moved from May 3 to May 10, 2009 due to the WLA prom being on May 2nd. The Experimental Theater is in the Frederick March Theater Bldg. This is the FINAL draft of the schedule for Large Group Festival, Wednesday, Apr. 29, 2009. Traveling Choir will be leaving after Noon A to critique other choirs (Kettle) and perform Kyrieleis (John Leavitt), For the Beauty of the Earth (John Rutter), and Betelehemu (Wendell Wahlum, arr. Barrington Brooks) for the WSMA judges. All performances will be in the Mayville High School auditorium, 500 N. Clark St. Mayville, WI. (map). Traveling Choir should return to WLA around 3:30 PM. Sunday, April 19, 2009 marks the second-to-last church performance of the WLA Traveling Choir. We have been on hiatus since the end of February after an almost two month straight Sunday performance schedule. March was a light month for church visits, but filled with two solo ensemble weekends, two Jaroslav Vajda Hymn Festival concerts, Palm Sunday, and Easter. Traveling Choir will sing during the 8 AM service at St. John's, Fox Lake (map) and the 10 AM service at St. Paul's, Manchester (map). The bus leaves WLA at 6:15 AM tomorrow morning, so I hope everyone gets a good night's sleep! 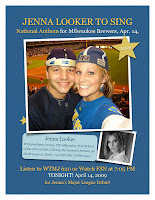 WLA grad, Jenna Looker ('03, UW-Milwaukee Peck School of the Arts '08), sang the National Anthem for the Milwaukee Brewers vs. Cincinnati Reds baseball game, Tuesday, April 14, 2009 at 7:00 PM. While it was not broadcast on either WTMJ 620 AM or on FSN , one of her friends posted a video on Facebook and YouTube. Thanks, Josh! We're proud of you, Jenna! Where is All the Easter Music? I don't normally write on my blog to take up a stance on an issue or try to persuade my audience (albeit a very small one) to think a particular way. I try to use my blog as an information tool for my choir students and their parents so they know what is going on with WLA Choirs (even though my top hit articles are about In Tune Magazine's Best Music Schools 2008 and 2009). But yesterday was Easter Sunday and I wanted to listen to Easter music. Everybody knows how inundated we are from October 31-December 25 every year with Christmas music. Entire radio stations dedicate their entire broadcast to all Christmas music 24/7. Yesterday I came home from church and just wanted to listen to Easter Music. I searched the iTunes Music Store. No popups or links for Sacred Easter Music. Somewhere in the back of my memory I remembered a "Resurrection Symphony" so I searched for that too. It yielded the Gustav Mahler Symphony No. 2, the "Resurrection". I was disappointed because there was no recognizeable hymn tune or chant melody to even suggest Easter in Mahler's work. I wanted to hear expressed in music the true message that Jesus Christ, true God and true man, who, as true Man, led the perfect life that none of us can ever hope to live, thereby fulfilling every part of God's law that he put on his chosen people, died on the cross on Good Friday in our place (the all-atoning sacrifice), and as true God raised himself back to life on Easter Sunday morning over 2000 years ago. I wanted to turn on the radio coming home from church and hear sacred Easter music that would reinforce the good news that I heard in church. I wanted to fill my iPod with glorious trumpets and strings and full orchestra playing major classical works which shouted Jesus' eternal triumph over sin, death, and the power of the devil. The piece which I thought I was searching for (The "Resurrection" Symphony) was really the "Reformation" Symphony of Mendelssohn (Symphony No. 5 in D Major/D Minor, op. 107), which uses EIN FESTE BURG IST UNSER GOTT (the hymn tune we use to sing Luther's hymn text on Psalm 46, "A Mighty Fortress is Our God"). I wasn't in the mood for Reformation (a.k.a. Oct. 31, 1517). I was in the mood for the trumpets of Easter. The radio wasn't much better. On the way to our family Easter gathering, I scanned all the FM stations, hoping for some Easter music. The best I found was on 89.3 WPNE (music listing for Easter sunday, April 12, 2009). I think it was either the St. John or St. Matthew Passion of Johann Sebastian Bach (after checking, it was the St. John Passion). I'm not sure because (a) it was sung in German, and while I did take two years of German in high school, my on-the-spot translation leaves something to be desired, and (b) I didn't hear the announcer introduce the work at the beginning, nor did I listen long enough to the end to see if all the recitatives and arias that I heard were Bach. I'm pretty sure it was, though, because I did hear two hymn tunes: HERZLICH TUT MICH VERLANGEN (O Sacred Head, Now Wounded) [a.k.a. O HAUPT VOLL BLUT UND WUNDEN] and HERZLIEBSTER JESU (O Dearest Jesus, What Law Hast Thou Broken? ), both of which I'm pretty sure Bach used numerous times in his passions. But even Bach was not "heart music" on Easter Sunday. It was "head music." I doesn't speak to American ears (or to any ears which don't know German). 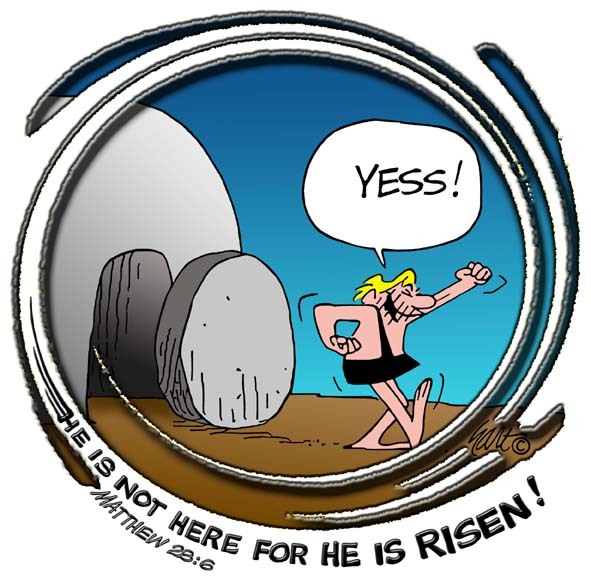 It doesn't even move Lutheran hearts when they can't tell that the text is really all about Holy Week and has nothing to do with The Resurrection. How disappointing, even from the father of Lutheran church music. Bach's Cantata No. 4 Christ lag in Todesbanden (BWV 4). What else did Bach write for Easter...I think he's got an Easter Oratorio (BWV 249). Ok, there's two...Doesn't David Holsinger or Randol Alan Bass have anything for Easter? They both have written large works for concert band or orchestra and choir. I'll have to look into their catalogs. Well, there's the Heinrich Schütz double choir motet "Ich bin der Auferstehung" (I Am the Resurrection), but once again, it's in German and doesn't have a recognizable hymn tune or melody for the casual Lutheran ears (even though I love the piece, have sung it and directed it). Oh yeah, Handel's Messiah. (Duh, Dale!) It was originally written for an Easter performance (April 13, 1742 in Dublin, Ireland). But out of its 53 individual arias, recitatives, and choruses, only around 21 of them (22-33, 45-53) are directly connected with Christ's suffering, death, and resurrection. Even fewer of them (45 & 46) are specifically about the resurrection of Jesus. So where is all the rest of the sacred Easter music???? I'm doing research on the origin of a song called "Sis Joe" which American composer Jackson Berkey incorporates in his popular choral work Sacramento - Sis Joe. The original "Sis Joe" is a strange little song–mixed meters, not a very beautiful or easy-to-learn melody, strangely repetitive but having quirky intervals. As I've done more reading, I've realized it was more of a call between workers on a railroad yard than it was a folksong. Alan Lomax recorded it in his Vol. 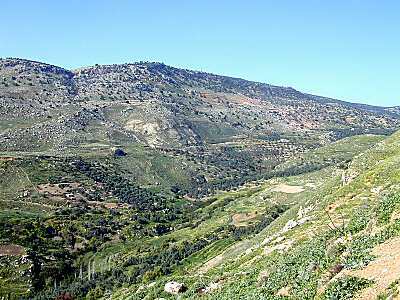 2 of Our Singing Country (Our Singing Country: Folk Songs and Ballads. With John A. Lomax and Ruth Crawford Seeger. 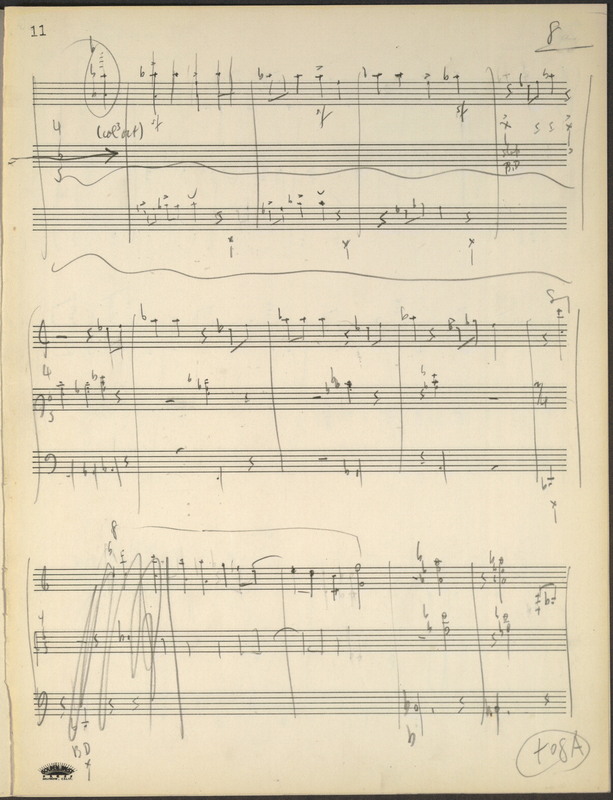 New York: MacMillan, 1941.) p. 362, 363, and 364 He included the tune with three verses and a track lining holler. The American composer, Aaron Copland, used "Sis Joe" in the first (Buckaroo Holiday) and fifth movements (Hoe-down) of his ballet, Rodeo. "Sis Joe" can be heard in this YouTube video from 2:15-2:28. Then the question comes "What do the words mean? All right now boys, let me tell you 'bout Sis Joe, this time, Sis Joe! Take a jack, get a man! ...."track heavy" ...could it mean the track was in need of repair? HEAVY REPAIR: Term used to indicate that a car is in need of repairs requiring more than 51 man-hours to complete. (from Encyclopedia of North American Railroads. Middleton, Smerk, and Diehl, eds. Indiana University Press: Bloomington and Indianapolis. © 2007. p. 1206 Appendix C, Glossary of Railroad Terms. Lining track. Shifting the track laterally to conform to established alignment. Maintenance lining is ordinarily done during repairs; general lining is done to make the track conform throughout to predetermined alignment. ..."take a mule on the sand"
...many men and jacks were needed to do the work. Now I'm wondering if the "Sis Joe" was stuck in the mud and that the men and mules and jacks were there to get it unstuck. I don't know. I'll keep researching this. Gen. 37:25 - Joseph was sold into slavery by his 11 brothers to a band of Ishmaelites who had just come from Gilead with balm. Jer. 8:22 - The prophet Jeremiah grieved bitterly for Israel because not even the balm of Gilead could heal their sins. Jer. 46:11 - Later in the book, Jeremiah goads Egypt they can't find help or healing in the balm of Gilead.